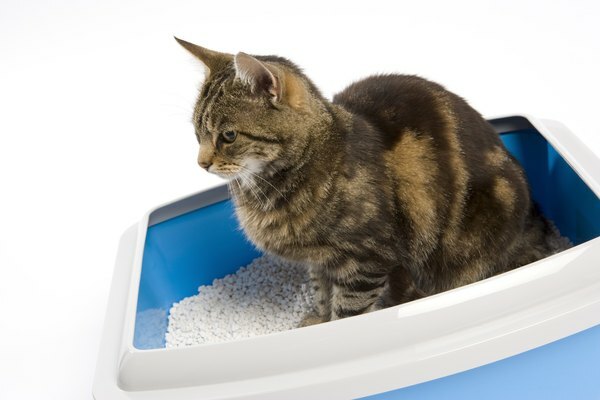 Frequent litter box use may be a sign that your cat has a UTI. You neutered your tom kitty for the responsible reasons and to keep him from spraying all over the house. Now he's had several urinary tract infections. UTIs are painful and can be life-threatening. Do what you can to prevent them from occurring and to make life easier for you both. Switch your cat to a veterinarian-recommended food to discourage crystals from forming in your cat's urinary tract. It used to be that you could get these foods only through your vet with a prescription, but many commercially available foods are now formulated to be healthier for your pet's urinary tract. Give your cat access to an abundance of fresh water all the time. Bistro-style water dishes that have a gallon reservoir are useful because you'll only have to fill them every few days and your cat will constantly have water in his dish. Getting plenty of water will flush your kitty's system and keep his urinary tract clear and in working order. You can't simply instruct your cat to drink a certain amount of fluid every day; he'll just ignore you as usual. If you don't think he's getting enough water, supplement his dry food diet with some canned food to increase the amount of moisture in his system. A small amount of low-sodium chicken broth or juice from canned tuna added to the water may also encourage him to drink more. Make a litter box available for each cat in your house and keep them cleaned. When a cat has a UTI, he sometimes associates the pain of urinating with the litter box, causing him to go elsewhere. And sometimes cats just like having a place of their own that doesn't smell like other cats. Providing a clean latrine for your UTI-prone kitty will make the experience as pleasant as possible and encourage him to use the facilities you've supplied for him. Talk to your vet about supplementing your neutered guy's diet with natural products like cranberry extract, omega-3 fatty acids, antioxidants and echinacea. The acidity of the cranberries along with the healing properties and infection-fighting power of the other supplements can help keep your cat's urinary tract healthy once he's over an initial infection. Encourage your cat to play actively. Neutered cats tend to gain weight, which can have the domino effect of leading to difficulties in grooming and causing complications that can include UTIs. Playing actively with your cat and providing him with toys that promote physical play is less expensive than buying him a gym membership and is more likely to help him keep his weight at a healthy level. That will benefit him in more ways than just by helping to maintain his urinary tract. Male cats in general are more susceptible to developing urinary tract problems than females. Be aware of your man-cat's litter box habits and immediately take him to the vet if you notice frequent use, straining and little or no result for the effort. If you suspect your cat has a urinary tract infection, don't delay a trip to the vet. UTIs can quickly turn into kidney problems and can possibly be fatal. Quick and thorough treatment is the best solution. When your cat is diagnosed with a UTI, follow the vet's instructions to the letter, feeding your kitty at the recommended times with the recommended food and giving him his meds until they're gone. Urinary tract infections are painful, so the quicker you can get your cat through it the quicker he'll start feeling better. What Are the Treatments for Difficulty Urinating in Cats?